China's VPN ban means many popular services no longer work. We've tested hundreds of services to find the best VPNs for China that consistently evade the Great Firewall so you can access blocked sites and apps including Facebook, Google, Gmail, Youtube, WhatsApp, Skype and others. We’ve updated this article with VPNs still working in China as of Jan 29, 2019. If you plan to visit or live in China and want to maintain access to western sites, apps, and services, then you’ll need a VPN. Not all VPNs work in China, and some that do are frustratingly slow. China’s advanced online censorship system, known as the Great Firewall, has made it a hotspot for VPN users. Both expats and native Chinese use VPN services to circumvent blocked sites and apps like Facebook, Google services, Tinder, western news media, Netflix, and even Comparitech. Tip: Many VPN websites are blocked in China, even though the VPN itself will work, so it is best to sign-up to your chosen VPN before visiting China if you are not currently residing there. ExpressVPN: Consistently works in China. Fast and works well with Netflix and other sites. ExpressVPN is possibly the most popular VPN service in China. It’s not the cheapest VPN on this list, but it remains popular among users in China for good reason. It has a huge range of VPN server locations, excellent and consistent speeds, allows three simultaneous connections, offers 24/7 live chat support and claims 99.9% uptime. The ExpressVPN app works across all major desktop and mobile platforms and is very simple to use. That includes Windows, MacOS, iOS, Android, Linux (command line), Fire TV, and compatible routers. Torrenting is allowed on all VPN servers, and Express usually has a handful of servers that work with Netflix. If you’re only visiting China for a short period, consider the 30-day money-back guarantee. BEST FOR CHINA:Our #1 choice. Reliably avoids China’s Great Firewall and unblocks Google, Facebook, Whatsapp, Instagram & Skype and more. Extremely fast connections and a huge range of countries available. Try it risk free with the 30 day money back guarantee. NordVPN recently announced it now works from China, which is good news especially for Beijingers and Shanghaiists who want a lot of simultaneous connections for a low price. NordVPN offers great bang for your buck, offering six simultaneous connections on one inexpensive subscription. It can also unblock streaming sites like Netflix US and Hulu, which block most other VPN connections. Torrenting is tolerated, and servers are available in more than 60 countries. Both desktop apps–Windows and MacOS–work in China. Android users should opt for the beta version of the newest app. Unfortunately, NordVPN’s iOS app cannot evade the Great Firewall at this time. BEST BUDGET CHOICE:A good all-rounder that works well in China. Strong security features and allow up to 6 devices to be used simultaneously from one account. Includes a 30 day money back guarantee. Surfshark now works in China as of 2019, which is great news for people who want to binge watch their favorite shows from western streaming services like Netflix, Hulu, and BBC iPlayer. Surfshark excels at unblocking stuff, and almost all of its servers unblocks Netflix, though most of them will redirect you to the US version. You also get unlimited devices on one subscription, which makes it a great option to share with a family or group of housemates. Surfshark keeps no logs, uses strong encryption, and includes a kill switch. P2P filesharing is allowed, and speeds are fast enough to make downloading and streaming a breeze. STREAM FROM CHINA:Surfshark will let you easily unblock Netflix and other streaming services from China, and it comes with a 30-day money-back guarantee. VyprVPN is one of the few tier-1 VPN networks with support for users in China, meaning it owns all of its own VPN servers and doesn’t rent them. That equates to fast, consistent speeds and excellent uptime. The Pro version includes a proprietary “Chameleon” protocol that masks VPN traffic to make it less susceptible to the Great Firewall’s deep packet inspection technology. It’s on the pricier side, but residents of China will be happy to know the company accepts payments from Alipay, a popular payment gateway in the country similar to PayPal. VyprVPN offers a decent number of locations. Live chat support is available. Our only complaint is with some of VyprVPN’s less-than-private logging policies, so frequent torrenters and Popcorn Time VPN users might want to look elsewhere. FAST SPEEDS:Excellent speed and uptime as all servers are owned by VyprVPN and a proprietary software hides the connection. 30 day money-back guarantee. Ivacy is a Singapore-based provider that recently added the ability to bypass the Great Firewall to all of its apps. Ivacy unblocks Netflix US, allows torrenting, and comes with 24/7 live customer support. It fared well in our speed tests and operates over 450 servers in 50 countries. Ivacy keeps no logs and secures connections with un-crackable encryption. Leak protection is built in, as is a kill switch. You can also set up split tunneling, which allows you to choose which apps go through the VPN and which go through a direct, unencrypted connection. Ivacy allows you to connect up to five devices at a time, and apps are available for Windows, MacOS, iOS, and Android. If you are in China, you can sign up for an Ivacy plan using the Exclusive Offer link below. GOOD VALUE:Claims to work in China and up to five devices can be connected from a single account (this page is in Mandarin). PrivateVPN works in China with a special feature called “Stealth mode” enabled in the settings. This adds a layer of obfuscation to your connection to make the encrypted traffic look unencrypted, which in turn makes the VPN more difficult for the Great Firewall to detect. PrivateVPN scores well above average in our speed tests, and it’s great for unblocking geo-locked content like Netflix, Hulu, and BBC iPlayer. Security is solid and PrivateVPN doesn’t store any usage or metadata logs about users’ online activity. Live chat support is available should you encounter any problems. Apps are available for Windows, MacOS, iOS, and Android. You may connect up to six devices at a time. STREAM FROM CHINA:PrivateVPN's fast speeds combined with its ability to unblock just about everything make it possible to binge watch your favorite shows from China, plus it comes with a 30-day money-back guarantee. When I lived in China, I mostly used Astrill. Individual plans are available if you only use one device, or get a family plan for a few dollars more and connect every laptop and phone in the house. The app is great, allowing users to either connect to a simple HTTP proxy in a couple seconds or opt for a full VPN connection. Download speeds are solid enough to stream video if you pick a server without a heavy load. Subscribers get many locations to choose from. The live phone and chat support teams are experienced in dealing with customers in China. Prices are expensive with a lot of optional add-ons. Can I use a free VPN in China? While we praised PIA overall in our review, the company admits it has trouble maintaining connections in and out of China. Users report poor quality, slow connections from China on HideMyAss. The company is also notorious for substandard logging policies that have gotten users in trouble with authorities in the past. This free university-run peer-to-peer network of volunteer VPN nodes was created as an experiment and as a way to circumvent censorship. I used it for a while in Beijing a couple years ago, but it has since stopped working. Keep in mind that all VPNs get blocked by the GFW from time to time. A quick look through comments on Beijing or Shanghai expat forums will reveal that none are perfect. But the best VPNs for China have proven themselves against a well-armed adversary. Using a VPN service is not technically illegal in China–in my three years of living there, I’ve never heard of a single person being arrested for using one. The goal of the authorities is to censor, not to punish. The Great Firewall uses a variety of tactics to detect and subsequently block access to VPN servers. One of these methods is called “deep packet inspection”, which looks at traffic as it passes through a local ISP’s servers to check for hallmarks of common VPN protocols like OpenVPN. Most of the VPNs we recommend above now use some sort of obfuscation to “scramble” the data and make it look like non-VPN traffic. The OpenVPN protocol is the standard option on most VPNs, and with proper configuration it can bypass the Great Firewall. However, that’s not always the case, and OpenVPN connections can be detected by packet inspection. The SSTP protocol for Windows uses port 433 by default, making it a good option for VPNs that support it including ExpressVPN and StrongVPN. Because blocking port 443 altogether would disrupt the internet–every website that uses HTTPS would be inaccessible–it’s highly unlikely that China would block all traffic on port 443. Another frequently recommended option is to use the L2TP/IPSec protocol. L2TP/IPSec is less likely to be blocked by the GFW than OpenVPN. Most devices have built-in support for L2TP, and your VPN provider’s app might include it as well. L2TP/IPSec offers similar speeds and level of security to that of OpenVPN. VPNs are the tried-and-true method for bypassing the GFW, but there are a few other methods that work with limited success. Lantern, a free peer-to-peer internet circumvention software, has grown quite popular. It uses a volunteer peer-to-peer tunneling network with exit points outside of China. Tor reportedly works with a bit of advanced configuration, however, it won’t work out of the box. Tor exit points are fairly easy for the Great Firewall to identify and block. You’ll need to set up bridges. Some SOCKS proxy applications such as Shadowsocks apparently work, but don’t expect great speeds or privacy. There’s also Surge for iOS, but it’s built for developers so don’t expect a very intuitive UI. PureVPN is our top recommendation, with servers in Beijing, Shanghai and Guangdong. Users inside of China report mixed results for tunneling past the GFW, though. EarthVPN and Astrill both have at least one server running in China. FlyVPN and SenVPN run a few servers each in China, but Comparitech has not tested these and cannot vouch for them at this time. HideMyAss has a server in China, but we would only recommend it as an absolute last resort. For more information on using a VPN service to tunnel into the mainland, check out our tutorial on how to watch Youku from outside China and how to get a Chinese IP address. WhatsApp is now fully blocked in China as of October 2017. After brief service disruptions during which users were unable to send photos and videos, China has now completely blocked the world’s most popular messaging app including normal text messages. The block coincides with the 19th National Congress of the Chinese Communist Party. Censorship is often ramped up prior to such events. A VPN will unblock all of the sites and apps listed here, including WhatsApp. What is the Great Firewall? The Great Firewall is the unofficial nickname for China’s advanced internet censorship system. Officially called the Golden Shield project, state-owned internet service providers restrict all internet traffic to and from China to just a handful of access points. This gives authorities the means to monitor and restrict access to content outside the country. The Great Firewall utilizes a combination of methods to censor the web including IP blocking, DNS tampering, keyword filtering, deep packet inspection, URL filtering, and manual enforcement. IP blocking is a simple matter of blacklisting the IP address of a server hosting a website. 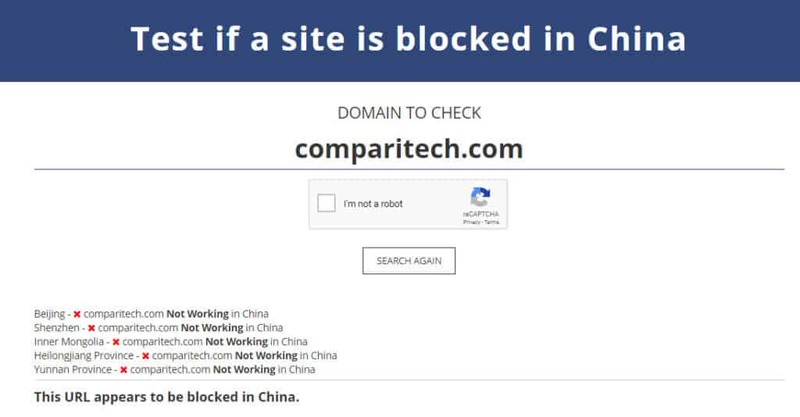 DNS tampering involves modifying the entry of a DNS cache so that a URL–such as www.comparitech.com–is resolved into the wrong IP address. Keyword filtering mechanisms scan search queries, messages, and web page requests for sensitive words and phrases. ISPs can prevent unwanted communication by hijacking DNS requests containing sensitive keywords and injecting altered DNS replies. Deep packet inspection, or packet filtering, can scan internet traffic for sensitive keywords or determine if a packet has been encrypted using a VPN protocol. Manual enforcement involves using China’s 50,000-strong internet police force to find and block IP addresses and URLs. To handle all of the internet traffic between the world’s most populous country to the outside world, complex intrusion detection systems (IDS) create copies of packets and pass them to filtering devices so that traffic flow isn’t interrupted. Most websites blocked by the Great Firewall remain blocked permanently, but some are only blocked temporarily. Because it is implemented on all the major access points for internet traffic in and out of the country, the Great Firewall can throttle international traffic to a crawl. This often happens after a government scandal, during anti-government protests, and every year around June 4, the anniversary of the 1989 Tiananmen Square massacre. Furthermore, websites that are blocked in one province might not be blocked in another province. This indicates internet censorship often begins at a lower level of government, and isn’t uniform nationwide. Tibet and Xinjiang, two western Chinese provinces known for insurrection and rebellion, have extremely limited internet access for only a few hours per day. Yes, using a VPN is still legal in China. Lately, we’ve seen a lot of poorly-worded headlines suggesting otherwise. In January 2017, a Chinese government ministry issued a notice announcing a campaign to crack down on VPN and special cable services throughout the country until March 31, 2018. The notice does not say using a VPN service is a crime. I cannot stress this enough, because this important point has been repeatedly misinterpreted by western media. The notice says that VPN providers cannot legally operate in China without government approval. It does not affect VPN users in any legal way, so far as we can tell. It might result in VPN servers getting blocked more often, however, so expect more frequent downtime in the coming months. No sane VPN provider maintains an official presence in China. Most do not have offices, employees, or servers on the mainland. That means they operate outside of the jurisdiction of Chinese authorities and do not require approval from the Chinese government to legally operate. Still, they might well be targeted for censorship by the Great Firewall if the government follows through on its threat. Will China block all VPNs? In July 2017, a Bloomberg report citing anonymous sources said the Chinese government has ordered the country’s three major internet and mobile carriers–China Mobile, China Telecom, and China Unicom–to block individual access to VPNs by February 1, 2018. If true and enforced, the crackdown would block all access to VPN services used to circumvent the Great Firewall. Update: China’s Ministry of Industry and Information Technology has called the Bloomberg article “false,” and says this year it has only blocked unauthorized VPNs used to conduct illegal business. Update #2: The supposed deadline for the VPN has passed, and Chinese telecom companies have confirmed that no such ban exists and they have not received any such notice from authorities. People in China continue to use VPNs safely and legally. While there’s always a chance that this could be “the big one” that blocks any and all VPNs indefinitely, we reckon it’s more likely to cause partial, temporary outages across the board. So don’t fret quite yet. The odds are that VPN users inside China will still be able to bypass the Great Firewall, although some might have to endure some service outages or change providers. All of the VPNs we recommend in this list have been operating in China for a long time. They have learned how to evade blocks and other obstacles thrown at them by the Great Firewall. We don’t see that coming to an end any time soon. When is your VPN likely to get blocked in China? This often happens around events that draw a large amount of political attention to China. One consistent example is every year on or around June 4, the anniversary of the 1989 Tiananmen Square massacre, a dark stain on the Chinese Communist Party’s reputation of which every mention is scrubbed from the country’s internet. Sometimes the new restrictions are permanent, and other times they are temporary. But VPN providers are usually able to resume normal operations within a few days. Google Play, like all other Google services, is blocked in China. That means you might not be able to access the Android version of your VPN provider’s app. Instead of Google Play, Android users in China are forced to use third-party app stores. There are tons of them, but they probably don’t have the app you’re looking for, either. Recently, China ordered domestic app stores to remove VPN apps from their listings, but even before that the chances of finding your VPN app were minimal. If you have an Android device and plan on going to China, we strongly recommend you get your VPN app and subscription before your trip. If you’re already behind the firewall, check your provider’s website to see if they have an APK file available for direct download. An APK file is the installer for an Android app. You will need to allow apps from unknown sources in your device’s settings to be able to install using an APK. Also note that if you install an APK file, the app will not automatically update. Be wary of APK files from third-party app stores and download sites that aren’t either Google Play or the VPN’s official website. APKs downloaded from third parties are often modified to carry malware and other nasty stuff. If you’re in China and you have a VPN on your desktop or laptop but not your Android phone, you can try sideloading the app. There are many ways to do this, but the simplest is to download the APK file onto your computer, then move it into your Android device’s Downloads folder via USB cable. Then you can easily access the APK on your phone and install it. Unlike Google, Apple has been allowed to operate its own app store within China. But to do so, it must abide by Chinese laws and regulations. That means when Chinese authorities request for an app to be removed from the App Store, Apple must remove it if it wants to maintain a presence in the country. In late July 2017, the realities of this arrangement hit home with VPN users. Apple has removed several VPN apps from the Chinese version of the App Store, including ExpressVPN and VyprVPN, among others. This comes on the heels of a regulatory notice earlier in the year announcing a crackdown on VPN services operating within China without a license. Regrettably, Apple is now complicit in censorship VPN apps that allow access to blocked content in China. China has enlisted Apple in ensuring that users searching for VPN apps on the App Store will not be able to find them. If you set up your iCloud and/or iTunes Connect in another country, you will still be able to find, download, and update VPN apps. They should continue to work even if you are inside China. If you set up your iPhone or iPad from within China and connected it to the Chinese App Store, however, you will likely be unable to find or download the VPN you need. The solution to this is to change the location of your Apple accounts. To do this, however, you will need a form of payment native to another country. If you don’t have this, you can try purchasing an iTunes gift card from another country and using that as a payment method. How much does a China VPN cost? VPN subscriptions cost the same amount no matter where you subscribe from. Depending on the provider and choice of plan, a one-month subscription typically costs between US$5 and $15. Most VPNs offer steep discounts if you sign up for a longer term, such as one-year. Many providers, including the ones we recommend above, also offer money-back guarantees. If you plan to visit China for a shorter period of time than the guarantee lasts, you can cancel your account after you’ve left at no cost. Works in China – obvious enough, but not all VPNs can bypass the Great Firewall. Speed – you’ll probably want to use your VPN to stream and download, so unlimited bandwidth and fast servers are a must. Server locations – servers geographically nearest to China, such as those in Hong Kong, Singapore, and Japan, will offer better speeds. Unblocking – In addition to bypassing the Great Firewall, you may also want to access streaming services like Netflix and Spotify while you’re away. They have their own geographic restrictions, and will require compatible VPNs. ExpressVPN, NordVPN, and VyprVPN all excel at unblocking streaming sites. Simultaneous connections – If you have several devices or want to share your subscription with family or friends, you may want a subscription with more simultaneous devices. NordVPN offers the most on our list: six simultaneous connections. Customer support – Sometimes VPN websites get blocked, so it’s useful to have multiple channels through which to contact customer support, including email and live chat. Apps – Make sure compatible China VPN apps are available for all your devices, as manual configuration may not work in China. Why is my VPN slow in China? VPNs will slow down your internet connection for a couple reasons. The first is that your data must travel further to get to its destination because it’s re-routed through the VPN server, adding an extra hop. The second reason is because VPNs are encrypted, so it takes time for your device’s hardware to encrypt and decrypt internet traffic on the fly. Typically this should only reduce your speed by roughly 10 percent or so. If you’re experiencing more severe slowdowns, it could be due to network congestion, VPN server congestion, bandwidth throttling by your ISP, or your device hardware is struggling to keep up with the encryption demands. You can try switching VPN servers to improve speed and increase bandwidth. Japan, Hong Kong, and Singapore are common options that are geographically near China. If your VPN is blocked entirely, it might have been blacklisted by the Great Firewall. We recommend contacting your VPN’s customer support for help with persistent issues. 15 Can I use a free VPN in China? 21 What is the Great Firewall? 22 Are VPNs legal in China? 23 Will China block all VPNs? 24 When is your VPN likely to get blocked in China? 27.1 How much does a China VPN cost? 27.3 Why is my VPN slow in China? 9 Can I use a free VPN in China? 15 What is the Great Firewall? 16 Are VPNs legal in China? 17 Will China block all VPNs? 18 When is your VPN likely to get blocked in China? 21.1 How much does a China VPN cost? 21.3 Why is my VPN slow in China? Have to say it works pretty fast and quite stable. Con to add to the list. No torrenting allowed. You will receive a DMCA notice and they may close your account if they receive a complaint. I have used 3 different providers and between them I prefer Nord to unlock restricted content from China. Mainly I use Nord apps for facebook, twitter and torrenting. Had some problems with p2p servers connection but support easily resolved it. Our company has its own VPN and I’m wondering if connecting to it when I visit China will trigger the Great Firewall to block our IP addresses. (By “sneaky” I mean using port 443, additional scrambling to avoid deep packet inspection, and using time based port knocking to prevent the GFW from connecting to our server). I used to use my alma mater’s private VPN a few years back. It worked for about a year and then got blocked. So there’s a chance that could happen to you as well. Similarly, when I made my own OpenVPN servers and clients, those got blocked after just a day or two. Not sure how well the port 443 thing works these days. You might have better luck with other obfuscation techniques, but they are more difficult to implement. I would say hope for the best but expect the worst. You can always get your money back with one of the money-back guarantee options above. I am not sure if it is temporary, if they fixed some issues, or of the technical details of using this VPN. All I know is I have been in China for about two weeks and it is working perfectly. The speed is very good too and only seems to be limited by the speed of the connection and the typical slow down when accessing anything outside of China. I lived in China for many years and used FlyVPN at that time, which I found to be an excellent VPN service. However, I really like the five devices option and low prices of Private Internet Access, since I use it at home in the USA for security reasons. Had no issues with Nordvpn when visiting China! The 99.9% uptime claim by Express VPN is false. It does work for days at a time, and sometimes even for a week or two straight, but then it goes down for hours and sometimes days. I am an English teacher in Daqing and depend upon it as a source for English teaching material and to stay in touch with loved ones. When it goes down, I am cut-off and the tech support tends to blame China and then claim their engineers are working to reconnect. Their “automatic” setting does nothing automatically. Their lack of people in China is a sore point. They have tried to get me to do free troubleshooting to help them out without any offer of free months or discounts. If they actually had people here who suffered through the service blackouts, they might actually learn empathy. I am planning on trying another service for my next year here. You lost me when you said that you depend on express to keep in touch with your loved ones. I can keep in touch with my loved ones overseas through email, and that works without a vpn. You can also use wechat. Super thorough and MUCH appreciated for someone about to move to Shanghai. Thanks so mcuh! Any experience with Witopia in China? Astrill works fine. I’ve used it for over 6 years and have rarely experienced any issues. If a server doesn’t work, I switch, then I’m good. Usually it’s only annoying during certain sensitive government events, but other than that it’s fine. The OpenWeb proxy it offers makes web surfing and Youtube easy without having to wait for normal VPN connections. I can understand if you have some comments about the pricing or customer service. But completely crossing it off? Are you being paid by one of their competitors? Astrill works – I’m using it right now! My Gmail is open, my iPad has Instagram open. It clearly works in China. I would comment on other VPNs if I could, but I’ve never had to switch. I find that works okay on iOS and Android, best on Windows. I have been using Astrill when I travel to China for the last 3 years. Love it. Only ever faced one technical issue, got the Astrill guys in chat and they helped me fix it within 5 minute. Thumbs up from me. Used ExpressVPN before that, but it was flaky and slow (not saying that happens for eveyone, but it was my experience). Hi Ken, we got a lot of complaints about it not working, so it seems to not be consistent for everybody, which is why we crossed it off (but didn’t remove it completely). ExpressVPN supposed to be the best? Doubt it.. 7 years in China and Express VPN only have 2 servers they recommend to use within China. I have used Astrill for 3 years in China. I do not think my ability to browse outside of china was ever interrupted for more than 5 mins…I have NOT experienced what others are saying. In fact, I had a great deal of trouble with VYPR. Even tech support was very quick to get back to me relating to any issue. I intend to go to Urumqi, Xinjiang for business. What VPN provider would you recommend? I’ve been using Astrill for over five years. No Issues. Friends using others have all complained of problems. I read all these articles not listing astrill… Strange. i’ve tried a few of those comparitech listed back when i was there lat year. if you haven’t been able to use the app, try to configure vpns like express and ivacy overyour router instead. see if that works. ExpressVPN is working most of the time in Taiyuan, Shanxi. Up to now I never had to contact service, because it just worked fine. You now get a license for up to 5 devices, which is enough for me. Let’s see if it will survive the announced shutdown on January 11th 2018. Your statement about Astrill is totally inaccurate. I live in China for 8 years and I have tried all major VPN services that claim they work in China. I have used ExpressVPN for 2 years and had nothing but problems. I had a hotline with their support, but never was there a permanent solution. Now I am using Astrill and it works great! When it disconnects bevcause the Great Chinese Firewall blocks it for some reason, I just select a different server and am good to go! So please check all these VPN services regularly before you make your statements. Astrill is the only one that really works in China. What alternatives do you suggest for companies with offices in China? My company uses a VPN to connect to manufacturing facilities outside of Beijing. We definitely need a fast, reliable option and soon. I’m not sure what you’re asking. Do you need a VPN to access your company’s internal resources? Because that will have to something you set up yourself, not one of the commercial VPNs on this list. Astrill has never not worked for me in Shenzhen. astrill works for no more than a few minutes and then blocked in Hainan for the past 2 years. I am now switching. also very poor support. They never told me it was a persistent problem and wasted me a lot of time.